Natural stone is a great way to enhance or add color and dimension to your landscaping project. With a large selection of natural stone, we offer Central Indiana residents, businesses and landscapers unlimited options for a variety of outdoor projects. Boulders, flagstone and wall stone are ideal for creating borders, walkways and, of course, creating walls. 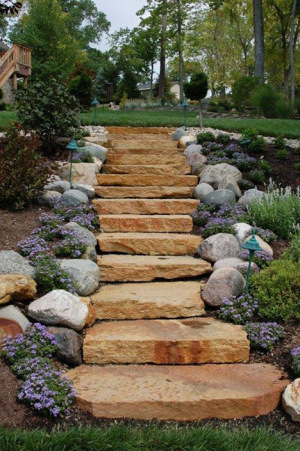 Our large selection of natural flagstone and steppers are perfect for patios and walkways that are unique to your landscaping project. Boulders, steppers, wall stone and decorative stone can also be used to create water features, fire pits, fireplaces, benches and other outdoor hardscapes to create your perfect outdoor retreat. Exotic rocks such as Mexican Beach Pebbles and Rainbow Flats offer dramatic enhancement when they are wet and are especially beautiful in any water feature. We work with you, the customer to help you select the perfect stone to create the personal oasis you desire. Once you have made your selections, we offer convenient delivery of your choice of stone directly to your home or business at affordable prices. At McCarty Mulch & Stone, we work hard to be Central Indiana’s premiere resource when you need rock and stone for your landscaping projects. We know that natural stone is more of an investment initially, so we do all we can to assist you in finding stone that fits within your budget. Our mission at McCarty Mulch & Stone is to help you get the look you envision that will compliment your home or business environment. Flagstone: Building a new patio, walkway or water feature? 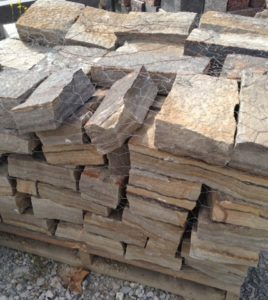 At McCarty Mulch & Stone we stock and sell flagstone from different quarries across the United States giving us a huge selection of flagstone in different colors, textures and sizes. Products include; Tennessee brown and gray flagstone, Indiana flagstone, Pennsylvania blue flagstone, and much more. Wall Stone: We have you covered across the board when looking for the perfect wall stone for your landscape. At McCarty Mulch & Stone we stock wall stone in different colors, sizes and thicknesses to suit your needs, including the easy to stack and popular limestone. From a few inches thick all the way up to 8” thickness, we know we have what you need for your wall project. Boulders: When you are looking for colorful, quality boulders at affordable pricing then look to McCarty Stone where we source our boulders directly from a number of different quarries across Indiana, Tennessee and Wisconsin giving us one of the largest selections in Indianapolis. Size range from 1-5,000 lbs. 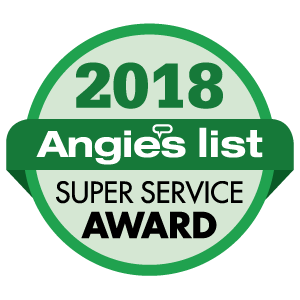 Products available include: Granite boulders, granite cobblers, Wisconsin cobblers, sandstone or green county boulders, Tennessee flats and cobblers, rainbow and Kewanee flats, local Indianapolis and Greenwood boulders, and much, much more. Outdoor Living Kits: If you are looking to expand your living space, our outdoor living kits are the right fit for you. Water features, stone benches, bubbling boulders or self-contained fountains to fire boulders, fire pits and fireplaces, we will find the perfect product to complete your project. These kits can be assembled by the do-it-yourself person or we can recommend Central Indiana expert to install your project. When you are ready to take your imaginative landscaping ideas and turn them into realities, contact McCarty Mulch & Stone so we can assist you in getting your project started. With our wide variety of landscape materials, affordable prices and delivery options, McCarty Mulch & Stone is your premiere hardscaping resource in Central Indiana for that next outdoor project!